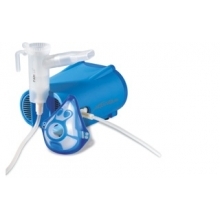 The Pari INQUANEB Compact nebuliser is supplied with the high-quality PARI LC reusable drug chamber, mouthpiece, tubing and adult mask. The compressor also features a useful chamber holder for when the unit is not in use. This product can be used to treat illnesses such as asthma, COPD and bronchitis.